I have a new hobby. It’s gardening in my apartment. I know what you are thinking … urban vegetable gardens! Nope. Google ‘urban gardening’ and the results are rife with tomato gardens on fire escapes, rows of onions in cement containers along balconies, and snow peas trained along open roof trellises. But I have neither a fire escape (at least outside where I can grow veggies), a balcony nor a roof. What I do have is one large window. Maybe it was this year’s unusually snowy winter that kept me inside, or the polar vortex with its frigid blasts, but I’ve been feeling the need to bring some Spring into my life. It’s been years since I have lived somewhere with a lawn or place to plant flowers outside. I used to have a vegetable garden. I was in high school and my dad dug a small square of clumpy earth with his tractor, which I surrounded with chicken wire to keep the ground hogs out. That last sentence makes me sounds like I grew up on the wild expanse of the midwestern plains, when in fact, I lived in a small town in the suburbs of Philadelphia, surrounded by other suburbs, malls and mall parking lots. I just happened to really like growing tomatoes. Dirt is good for the soul. Our ancestors began cultivating wild plants to serve their own survival and humans have not stopped since. 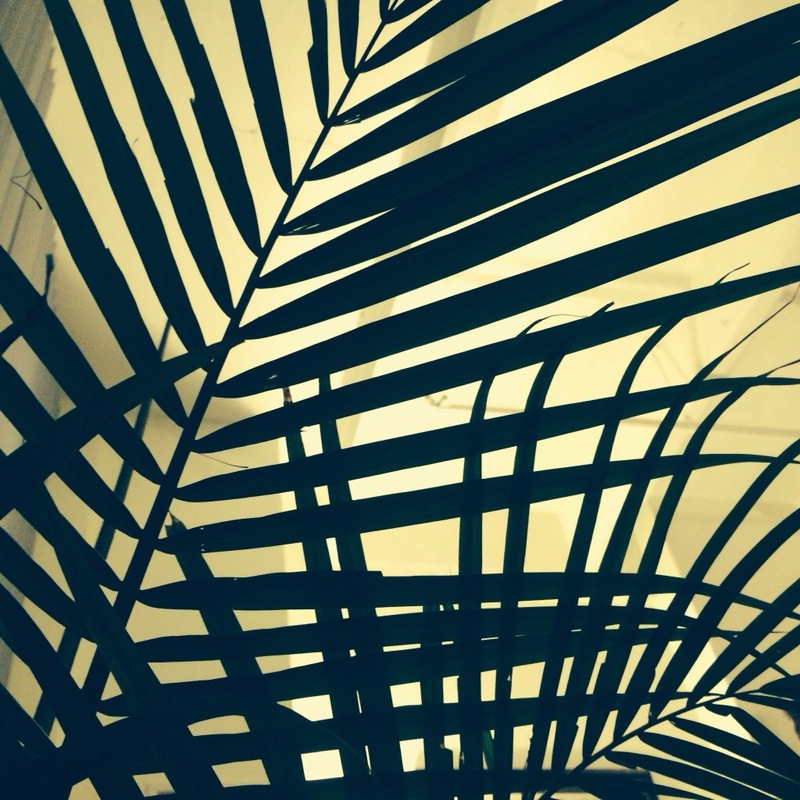 Our relationship with plants keeps us fed, but also reminds of us where we come from. The smell of warm earth signals Spring, telling us it is safe to emerge from our apartment-caves and be open to the world again. And growing flowers or plants indoors is a way to preserve some of that connection to the natural world, even living in a city where the nearest tree is a four block walk away. But back to my apartment garden… the restrictions are these: not much space, no outside space, and a cat who puts her nose in everything. So my husband and I decided to try a terrarium. The first one was jungle-themed and we are growing it in a miniature glass greenhouse on the bookshelf by the window. 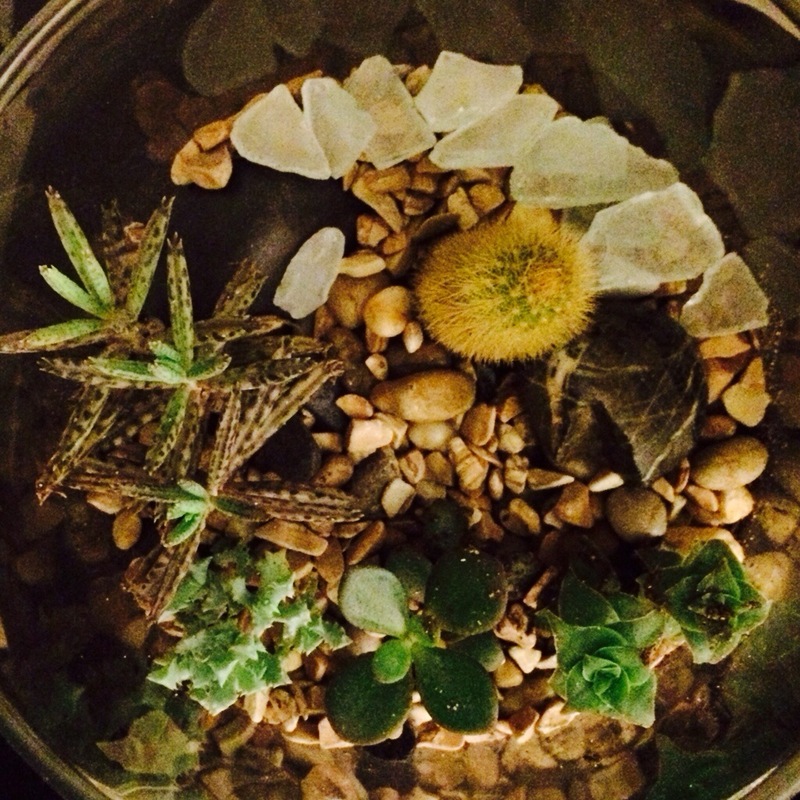 For the second tiny world, we wanted to go in the opposite direction, so purchased a miniature cactus and several varieties of succulents (shout out to City Planter). An interesting facet of terrariums is that when grown in glass containers, both the leaves and the roots are visible. This allows you to decorate the scene above as you would any outdoor garden, but also to carve patterns with pebbles into the earth below. A desert theme is also a nice way to ease into indoor gardening – requiring only lots of sun, and the occasional watering. Decorating a new place can be an expensive adventure. There are the usual expenses like any new furniture or kitchen supplies, but then there are the not so fun extra expenses ~ you almost never see new bath mats, or silverware organizers in beautiful home decor magazines. However, while there is no easy way to make some of those more mundane essentials at home, you can make something new out of some old items to perk up your living room. I obtained this little vanity from a relative who had it in storage for a few years. 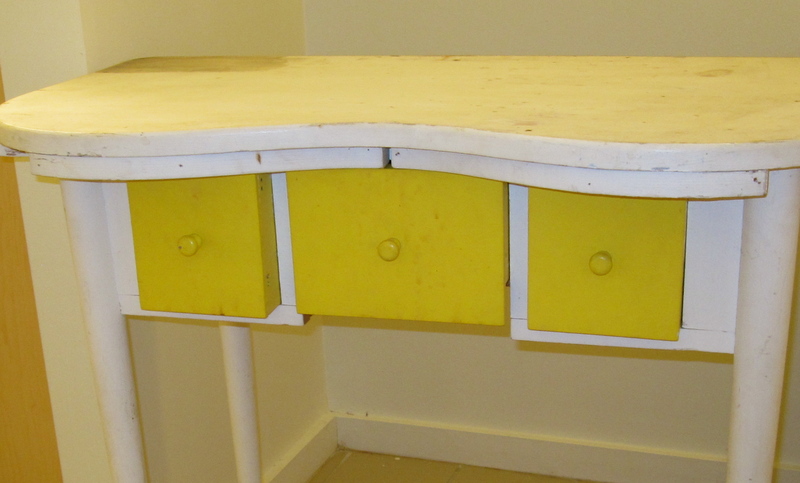 It looks to be a child’s size dresser with three small drawers, painted white and lemon. I can’t tell you where to get your own dresser, but I can recommend how to spruce it up when you find one! 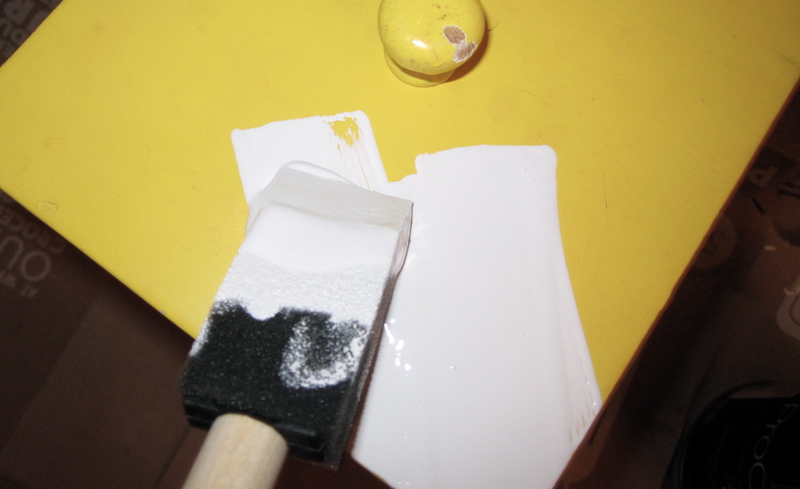 Note: before you paint a light going over with some sandpaper can help to smooth the surface. It also removes any dust that a damp cloth misses. I enjoy painting things at night. There is something about the cool silence of the evening hours that is conducive to decorating. So one night, I spread flattened paper bags on my bathroom floor to catch drips, popped open the quart of paint (white diamond), grabbed a sponge brush and began painting. I started with the legs to make sure that I could get good coverage – and turn the table over if needed without smudging any paint on the top. 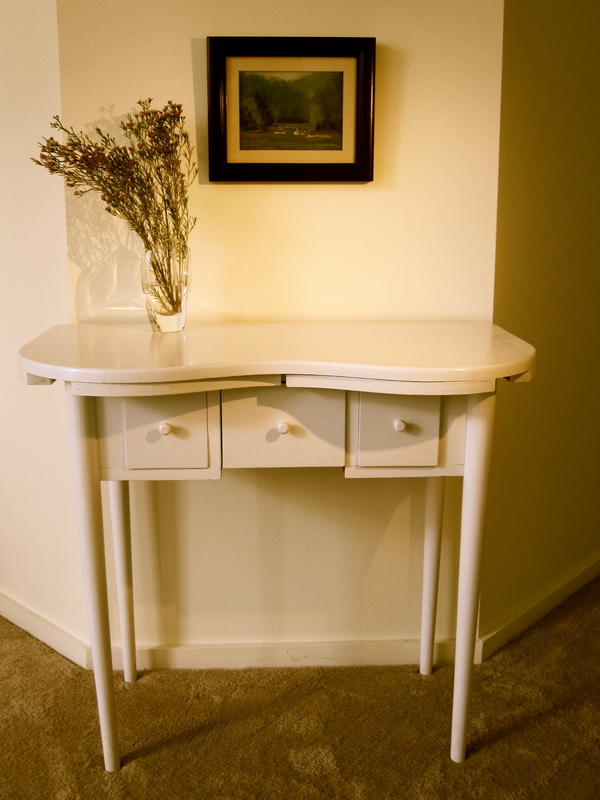 Give your new furniture enough paint to make sure that the end result is flawless. I know that the distressed look is very ‘in’ right now, but clean and neat is a classic look! The way to insure that your paint job will come out smooth and glossy, without any holidays (uneven or bare spots) is to give it two coats … this is the same strategy that I use for getting an even shine with my finger nail polish too! Viola ~ a cute new corner for my living room!